Most people consider car accident lawsuits involving pedestrians being struck by a vehicle to be slam dunks, but this misconception is driven by common misunderstanding of the law and how comparative negligence works. There are numerous factors that need to be considered when determining fault in any accident and the amount of compensation that can be recovered is now impacted by whether the party with the least fault still contributed to the accident. Whether you were a pedestrian struck by a motorist or the driver who was involved in an accident with a pedestrian, there is still a burden of prove required in order to determine fault and this needs to be considered when building a case or creating a defense. In most scenarios, pedestrians are given the right of way when occupying roads and motorists must be aware of their presence and take the precautions needed to avoid causing them any harm. This is not a license for pedestrians to break laws that govern when and how they are allowed to enter or cross streets, however, and it is possible for a pedestrian to be declared partially or completely at fault for a car accident. The following considerations are taken when trying to assess fault following an accident involving a motorist and a pedestrian. Were any laws broken? Factors such as the speed of the vehicle, adhering to traffic signals and whether the driver was under the influence of drugs or alcohol at the time of the accident can all be turned around on the pedestrian. 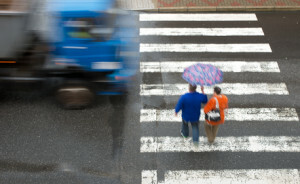 Pedestrians must cross the street only at crosswalks or where traffic control devices allow them to cross safely and jaywalking or entering the street while intoxicated could make the pedestrian at least partially liable for the accident. Where did the accident occur? The location of accidents involving pedestrians is important when determining fault because some roads do not allow pedestrian access. Such areas include bridges, highways and major thoroughfares. Did the pedestrian take precautions? It is possible to be declared responsible when acting carelessly or recklessly. While it is the responsibility of drivers to be aware of pedestrians and provide them with the right of way, they cannot be expected to avoid accidents when the pedestrian carelessly enters the street or intentionally obstructs the path of the vehicle. It can be possible to declare one party completely at fault following an accident, but this is the exception to the rule. More states are implementing comparative negligence doctrine, which assesses damages based on the role of each person in the accident. If one party is determined to be at fault but the other contributed by breaking a law or acting recklessly, the amount of compensation the at fault party is liable for may be reduced according to the amount of liability held by the victim. The comparative negligence rule was primarily instituted to protect drivers from frivolous lawsuits or from pedestrians seeking unfair compensation for accidents that they caused directly. The down side is that it may significantly reduce the value of car accident lawsuits and make it more difficult for victims to recover an adequate amount of compensation to meet their needs. An example of comparative negligence in practice would be if a motorist was determined to be at fault for hitting a pedestrian as he or she was crossing at a traffic signal. However, in this example, the pedestrian is considered liable for not being aware of traffic and for not crossing while instructed to by the walk sign. The party considered more liable than the other would receive compensation from the other and the compensation would be reduced by his or her percentage of fault. In this example, if the driver was considered 60% at fault and the value of the pedestrian’s damages was $15,000, he or she would receive $9,000 instead. Each state has different rules concerning how damages are divided as well as the amount of compensation the party most at fault may be required to provide. For more information about comparative negligence laws and how they may impact your ability to sue for damages following a car accident, contact the Rosenfeld Injury Lawyers LLC. Most states now consider comparative negligence when assessing these types of cases and we can let you know the laws that apply in your state and how best to approach your case.